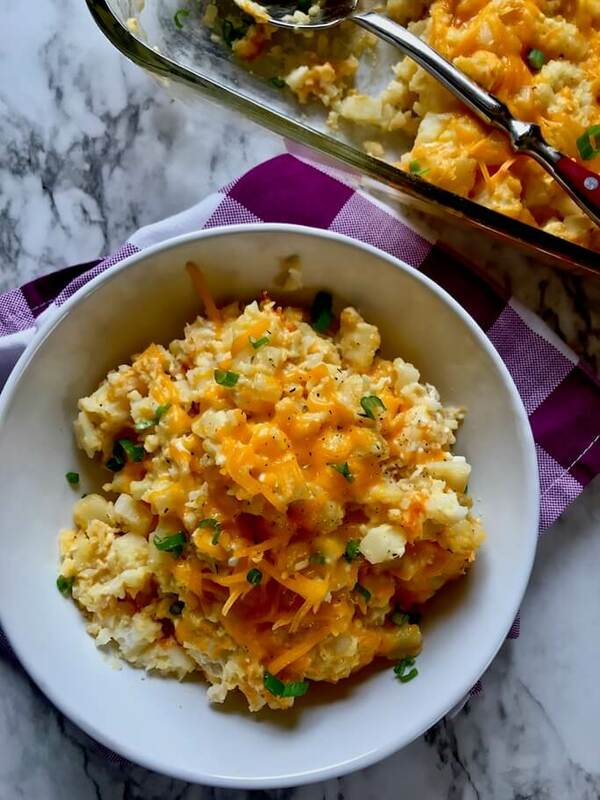 Cheesy Potatoes! Ahh, my favorite Midwestern staple that you’re sure to find at every get together, pot luck, or BBQ. They’re a perfect side for a turkey or ham dinner, cheeseburgers, grilled chicken… pretty much anything. So I went ahead and gave’m a Skinnyish Dish twist. 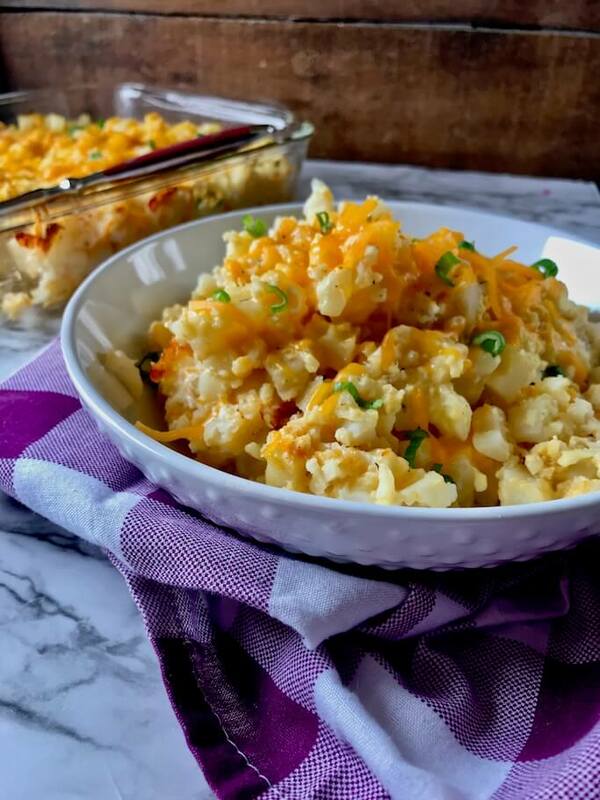 These Skinny Cheesy Potatoes have all the taste, thanks to a few surprises hidden in there that keeps’m easy, dreamy, and cheesy! First things first – I’m looking out my window… It’s snowing, and it’s April 14th. Who else is COMPLETELY over this? I was just thinking about taking Pepper to the greenhouse to pick up some flowers, and we could start planting our own little garden. But it’s a good thing we didn’t! Because here we go again… the weather in the Midwest has always got a few hi-lar-i-ous tricks up its sleeve. So until this madness passes, I’ll just continue putting comfort food on the menu. Because in this weather, it’s easy! Now let’s talk about these Skinny Cheesy Potatoes. 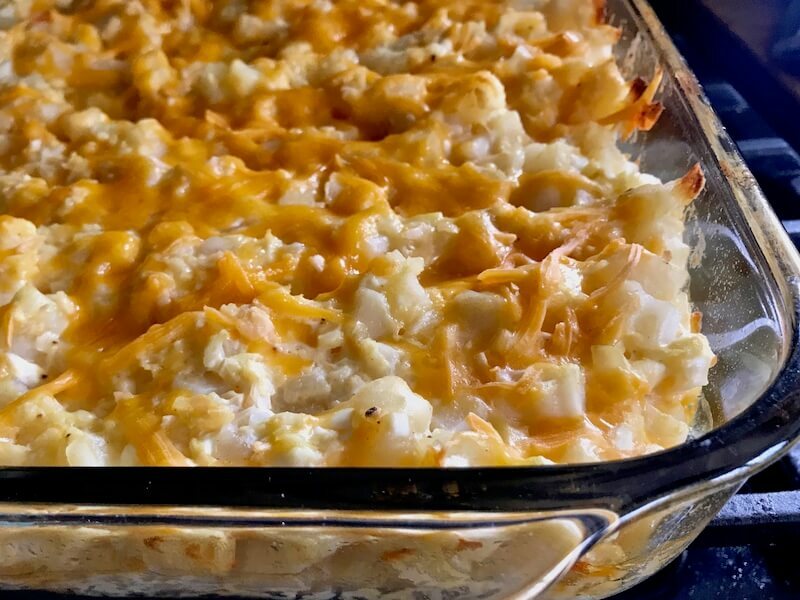 How does one make something as rich, gooey, and delicious as these good ol’ cheesy potatoes into something called “Skinny Cheesy Potatoes?” To be completely honest, it took quite a few attempts. I kinda hoped lightening these babies up would be a no brainer.. but I wanted to get em juuuuust right for y’all! And, well, I’m a lil bit of a perfectionist when it comes to things like Cheesy Potatoes. How did I lighten them up? Some easy tricks like swapping out the sour cream for nonfat Greek yogurt and using sharp cheddar cheese made with 2% milk… but that’s the obvious stuff. I also decided to be sneaky, and add frozen cauliflower rice to bulk it up with some nutrition! You all still with me? Don’t close this browser window just yet! I know guys, cauliflower. In my experience, you’re either a fan of it, or simply not much at all.. and truthfully, I’m not a big fan of it, most of the time, by itself. You usually won’t find me swapping out regular rice for the cauliflower kind. But what you will find me doing is using cauliflower to bulk up meals. And it turned out to be the perfect addition to these Skinny Cheesy Potatoes! The cauli rice add an extra dose of nutrition, and bulks up the serving size without breaking the bank on points/calories. If you’re from the Midwest, you’ve more than likely had somethin’ like these at a get-together like a family party, BBQ, holiday dinner, or… funeral. Yep, they’re sometimes called “Funeral Potatoes”. But for reasons I don’t need to explain, I moved away from that name, so I’ll never call’m that. You might be wondering where the crunched up cornflakes are, because that’s an ingredient that many people throw on top. You won’t find’m here! I’m following in my mom’s culinary footsteps. In her recipe, there never were any cornflakes. I’ve always enjoyed ’em this way, and I just feel like they weren’t all that necessary. So to save on the extra calories, I’m gonna go ahead and skip ’em. First up, preheat your oven to 375 degrees. Then you’ll need a big bowl. Throw in a 32oz bag of frozen hash brown potatoes, either diced or shredded will do fine. (Personally, I prefer it with the shredded hash browns. But I wasn’t paying attention, and grabbed these diced ones at the grocery store- they worked fine.) You’ll also need about 3 cups of frozen cauliflower rice. I let both those frozen ingredients thaw for 8-10 minutes before adding anything else in. You don’t have to do this, but it makes it easier to stir. Throw the goods into the bowl. You’ll actually see here that there’s some cream of chicken soup in there… I took these photos before this was all finalized, and because it was part of the original family recipe, I figured cream of chicken soup was necessary. Turns out, it’s not! At least not in this Skinnyish recipe, folks. I Also know some of you have strong feelings against it, so I just left it out. Just ignore that in the photo. You can totally add it if you want, but it’s not needed. 1-1/2 cup low fat cottage cheese. Don’t panic! It’s good in stuff like this. You won’t even know it’s there. I do not like cold cottage cheese. I actually think it’s gross! But once you’ve been around this ol’ blog for a while, you’ll see that I tend to use it quite a lot. It helps make things creamy without a ton of fat and/or calories. 1 cup nonfat Greek yogurt. This is an excellent healthy alternative to sour cream. And with the right amount of flavor in the mix, it’s pretty tough to detect. 1 cup Sharp Cheddar Cheese (the “Made with 2% milk” variety). 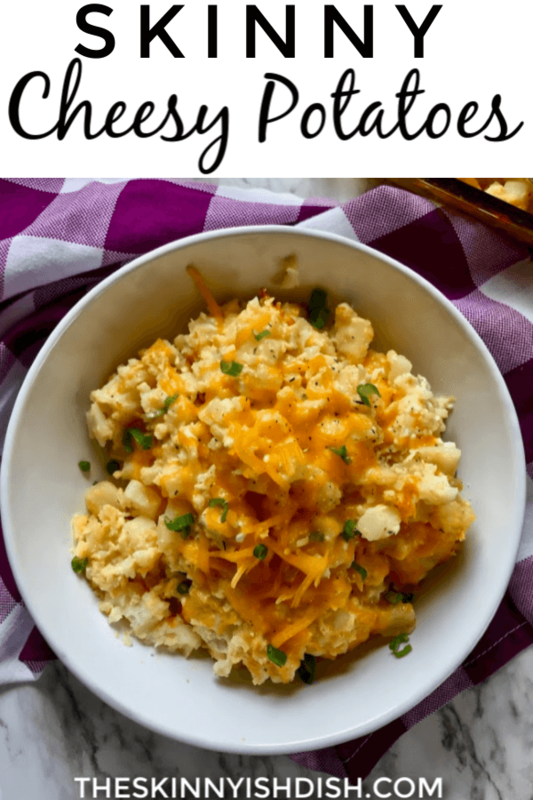 No way to have cheesy potatoes without it! Definitely go with Sharp Cheddar, because that cheddar flavor needs to be right up front, at the head of the line. 2 Eggs. These just help bind it all together. 1/4 cup Dried minced onion. You can find this easily in your grocery store where all the other dried spices are. 2 tsp Lawry’s Seasoned Salt. This is my personal favorite all-purpose seasoning salt. But like I always say, go ahead and use your family’s fave if you want! 1 tsp Garlic Powder. 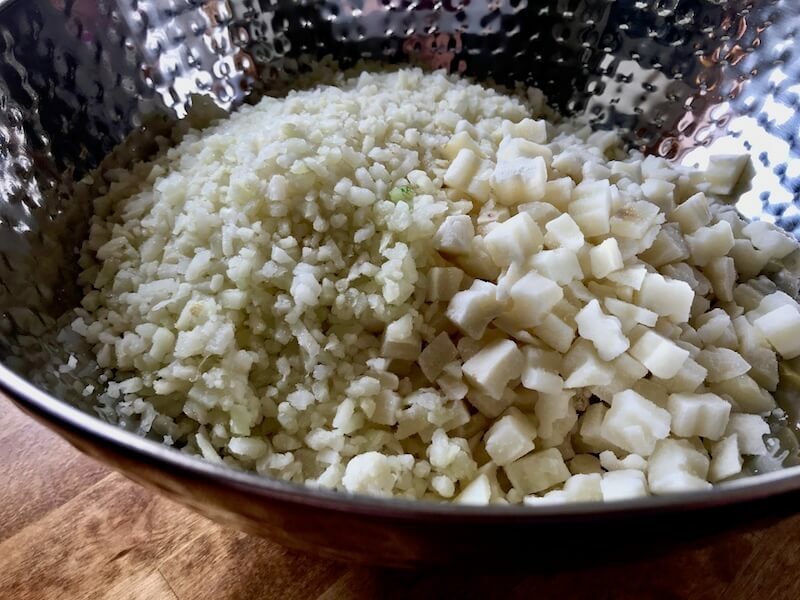 Because… garlic! You can also mince up a few cloves if you have the fresh stuff. 1 cup Low Sodium Chicken Broth. Stir it up really, really good! Like, so good. 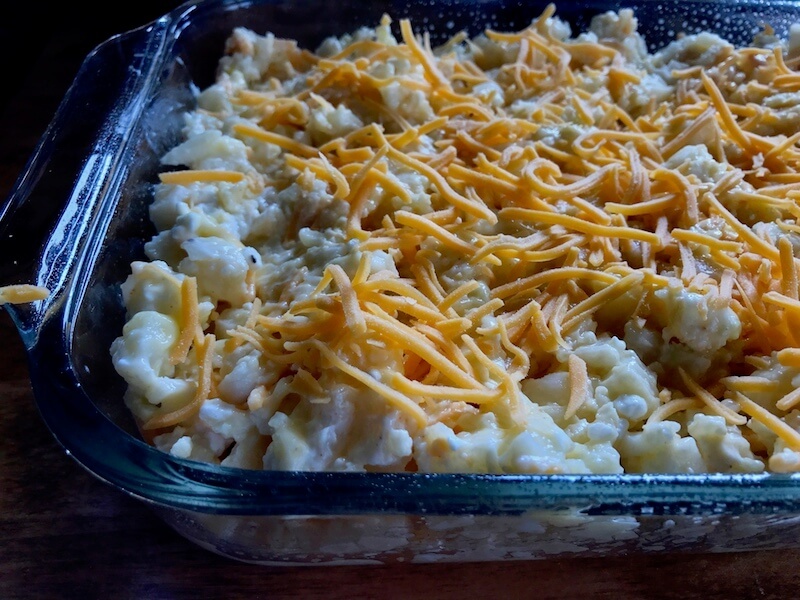 Grab a 9×13 casserole dish. Spray it well with cooking spray, and then scoop your cheesy potato mix into the dish. Now top it off with 3/4 cup sharp cheddar cheese, and then lightly spray the top with cooking spray. (This helps keep the cheese from sticking to the aluminum foil.) Cover it up with aluminum foil, and pop it into a preheated 375-degree oven for about 40 minutes. Remove the foil, then continue to bake for another 15 minutes to brown it up a bit. Oh heavens, this Skinny Cheesy Potatoes situation I’ve got goin’ on here is just amazing. Seriously… There’s not much to say, except these babies deserve a spot on your dinner table tonight. 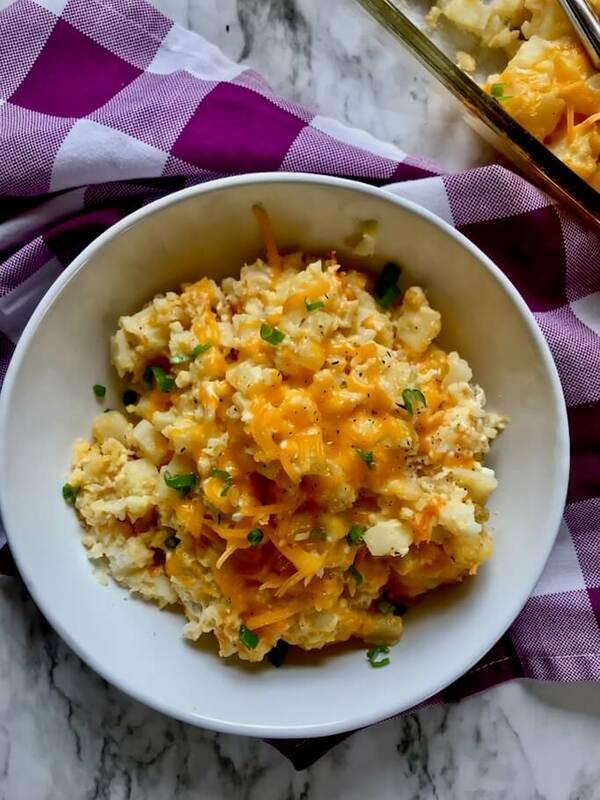 Bring Skinny Cheesy Potatoes to any old family dinner or gathering of friends, and you’ll be the talk of the table! They are just so stinkin’ yummy. No one will believe they are healthy, even if you tell them! This dish is the perfect marriage of healthfulness and indulgence. I made these just yesterday for a big family dinner, and everyone loved them so much! The only person who was a bit iffy on ’em was my brother-in-law, because he really hates cauliflower. (Trust me – when it comes to food, my family knows not to lie to me. If I cook for them and they don’t like it, I may get a little salty. But I’d be even more mad if they lied to me!) 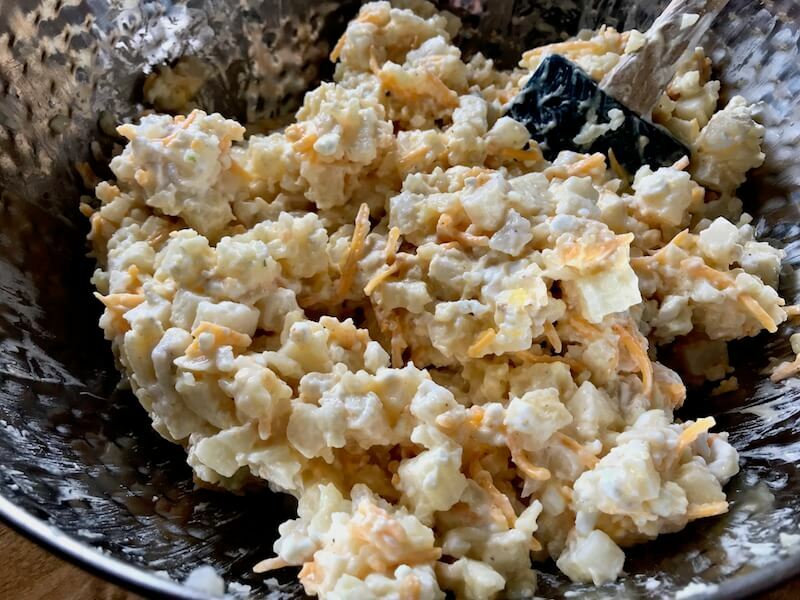 But even he finished his entire helping, so I’m calling that a victory over a picky eater… Skinny Cheesy Potatoes For The Win! Haha! Leftover Skinny Cheesy Potatoes? Here’s an idea! I’m surfing this crazy internet food wave too, folks! To tell you the truth, some of us were way ahead of the curve on this whole bowl-meals-of-mixed-food thing. Since I was a kid, I’ve been mixing all my food up in one bowl… so it comes natural to me! Example: the other night I baked up some turkey smoked sausage with peppers and onions. Then I piled it on top of a helping n’ a half of these Skinny Cheesy potatoes, and called it a meal. It was DELICIOUS! I also love mixing these in with a couple eggs and a crumbled-up piece of bacon. 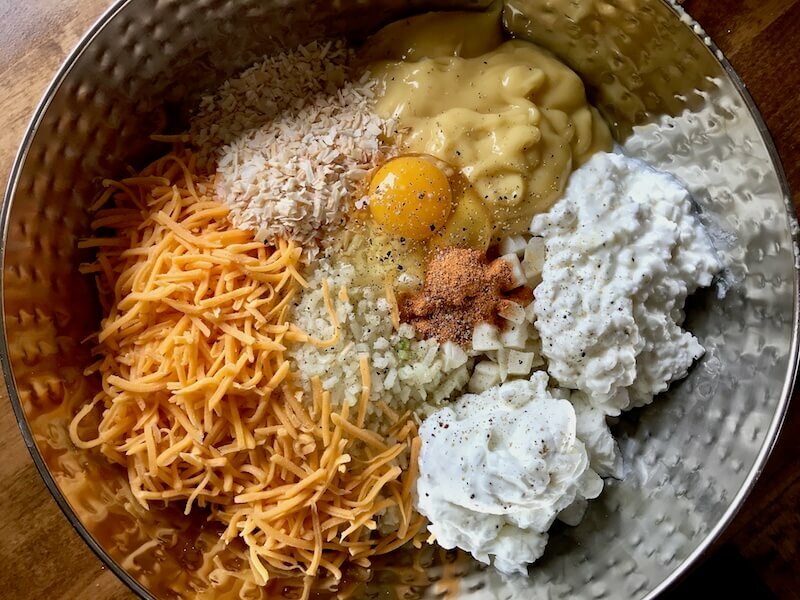 And now I’m getting an idea for some kind of fritter, but I’m all out of Skinny Cheesy Potatoes… it’ll have to be next time. My readers are a lot like me- they love food, and they enjoy mixing things up. So if you come up with more great Bowl ideas, share them in the comments section below or on Instagram or FaceBook, and let us know! OHH, so dang yummy. I’ve made these four times in the past week and half, and I STILL want to make some more! Skinny Cheesy Potatoes are a perfect addition to life. Remember to let me know if you’ve made them! I love seeing your photos on Instagram. Need some other yummy side dishes? Give these a try! These Skinny Cheesy Potatoes are a much healthier version of a Midwestern classic. 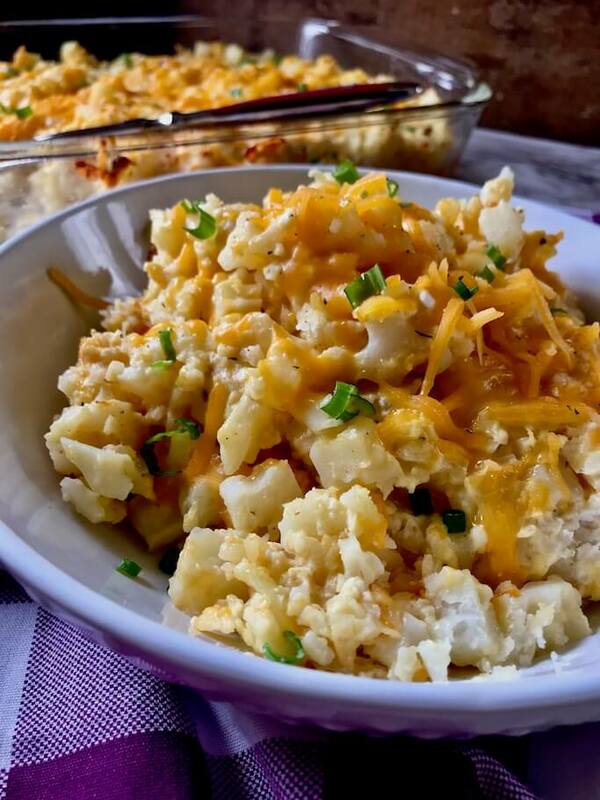 In a large bowl add the hash browns, riced cauliflower, cottage cheese, 1 cup sharp cheddar, seasoned salt, pepper, eggs, Greek yogurt, and chicken broth. Mix together VERY well. Spray a 9×13 casserole dish well with cooking spray. Add cheesy potato mixture, and spread evenly into the dish. Top with the remaining 3/4 cup sharp cheddar cheese. Spray top of the casserole with some more cooking spray to prevent cheese from sticking. Cover tightly with aluminum foil. Bake for 40 minutes covered. Remove aluminum foil, turn the oven up to 425, and let the cheese brown up for another 15-20 minutes. 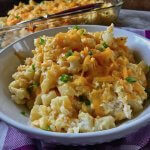 You just knew that I needed a “hash brown” casserole recipe for Easter!!! Can’t wait to try these!!! I hope you enjoy, Sarah! Let me know how it goes! Do you think these could be done in the crockpot?! Fingers crossed! I don’t really see why not, but I haven’t tried it. Make sure to spray the crockpot well with cooking spray. I would say low for for maybe 4-5 hours, but I’d keep an eye on it from time to time so it doesn’t overcook. Let me know how it goes if you try it! You’re welcome, Jen! I hope you love them as much as I do!